Posted on February 4, 2016 by Barry V.
Early December is one of those in-between times for birders. The migrations of autumn are mostly past, and the winter visitors have yet to arrive. A walk in the woods at this season can seem devoid of avian creatures, but this morning at Attleboro Springs Wildlife Sanctuary, I manage to be in the right place at the right time. Birds tend to gather into mixed flocks at this time of year, roaming together in their search for food. 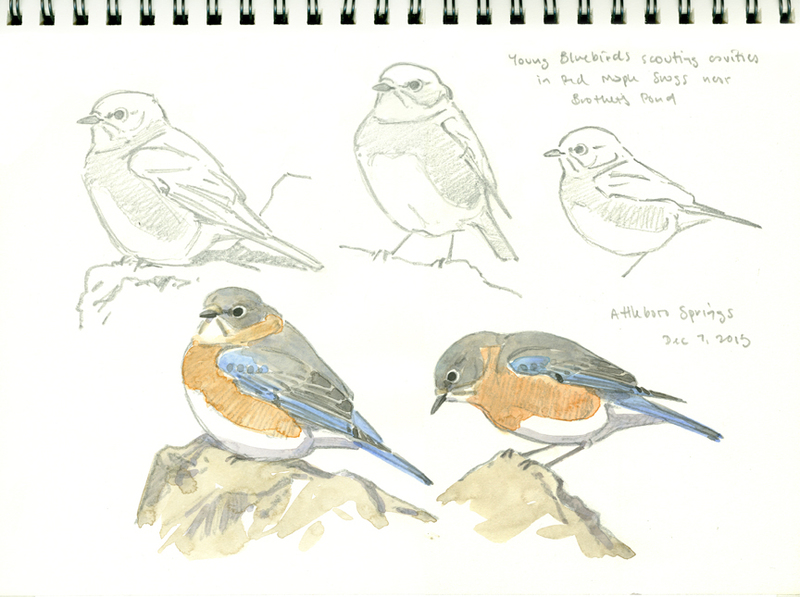 Most of the birds in these “guilds” are year-round residents, but some are late migrants (e.g. 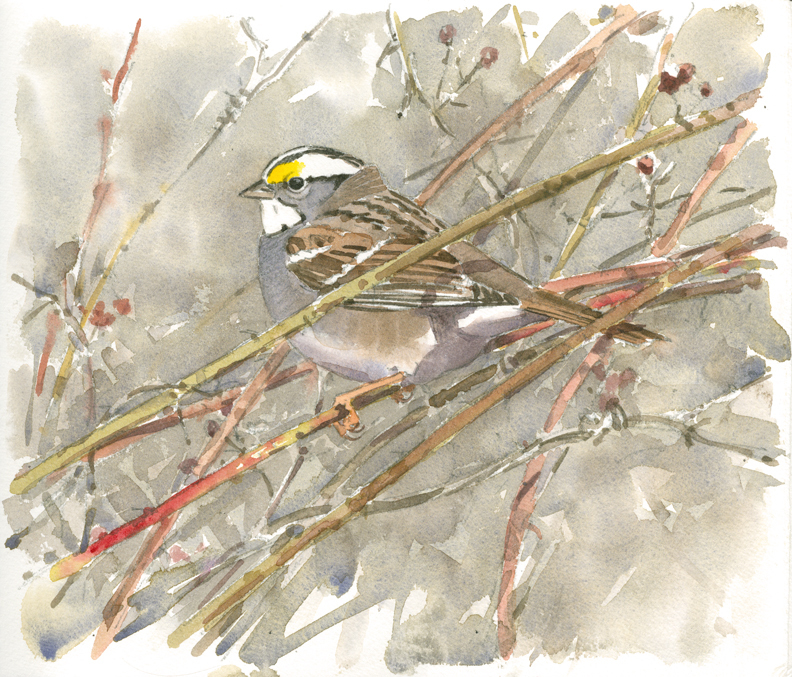 white-throated sparrows), and some are winter residents – birds from the north who spend the winter in our area (e.g. juncos and tree sparrows). The path to the Meadow passes through a brushy thicket, where I encounter one of these winter flocks. The thicket is catching the rays of the morning sun and forming a warm, protected pocket. There are lots of juncos and white-throats, along with chickadees, blue jays and robins. A Carolina wren, a downy woodpecker, a nuthatch and a male cardinal round out the group. The white-throats and cardinal are especially cooperative, so I take some photos and start some drawings that I later finish in the studio. I depict the white-throat deep in the thicket, surrounded by bramble canes; while the cardinal is in a higher perch above the tangle. 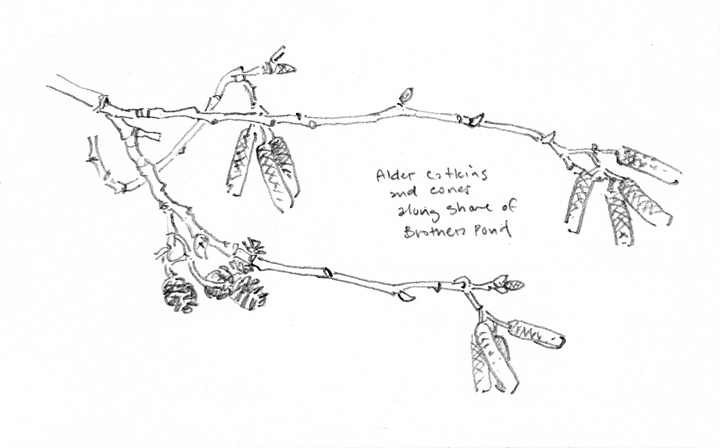 At Brother’s Pond, I’m engrossed with drawing the alder catkins and twigs, when another group of birds moves through. Most are juncos, but there’s also some flashes of cobalt blue – a family group of bluebirds! The adults and youngsters are scouting out cavities in the red maple snags along the canal below the pond. Bluebirds, being cavity nesters, are instinctively drawn to holes in trees, and these birds flit from snag to snag, peering into holes and crevices. Puddingstone looms large in local lore and legend, and figures prominently on the sanctuary maps of both Oak Knoll and Attleboro Springs. Puddingstone is a conglomerate that consists of rounded stones embedded in a “cement” or matrix of contrasting-colored rock, giving the appearance of a raisin pudding. 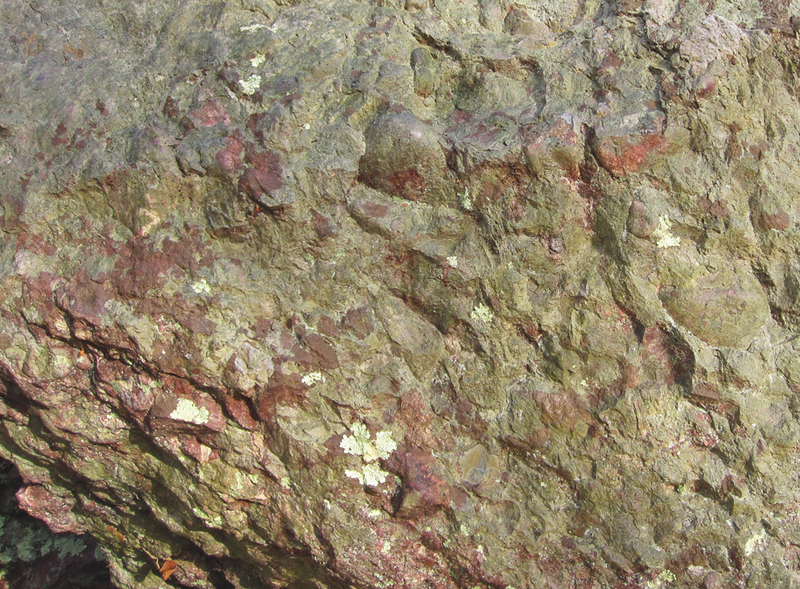 The Attleboro variety of puddingstone features purplish cobbles embedded in a greenish matrix. I find the most attractive examples of these distinctive rocks in an outcropping along the Reflection Trail. 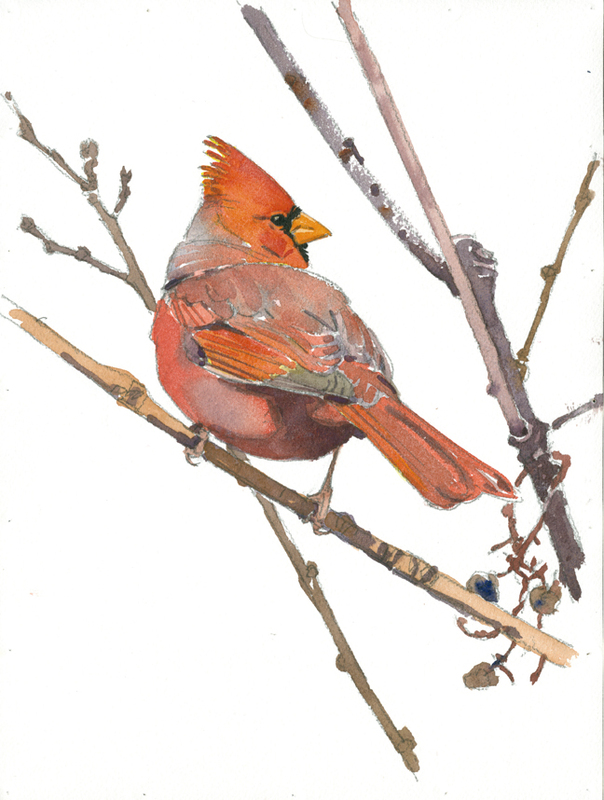 This entry was posted in Artists, Barry Van Dusen Residency, Museum, News and tagged Alder catkins, Attleboro Springs, Attleboro Springs Wildlife Sanctuary, Baby birds, Baby bluebirds, Bluebirds, Cardinal, Cold-press watercolor, Northern Cardinal, oak knoll, oak knoll wildlife sanctuary, Pen, Pencil, Puddingstone, Twigs, Watercolor, White-throat sparrows on February 4, 2016 by Barry V..